one of the season’s best stop of the World Tour among all WCS contests and reinforces the idea that Rio de Janeiro must be in the calendar of international skateboarding. The Skate Park at Lagoa Rodrigo de Freitas, between 4 and 6 March 2011, will bring together leading names and new skateboard jacks, including veteran Andy Macdonald - eight times world champion - who is participating for the first time in the event, and newcomer Pedro Barros, 15, last years’ revelation (he landed 4th) but just won the 1st place in February 2011 at Bowl-A-Rama both at Wellington and Bondi. The dispute between the experienced players and new talent of skateboarding has everything to become a suspense. Marcelo Bastos, winner of the 2010 edition of Oi Vert Jam world champion, has already confirmed his presence and is ready to defend his title. "The competition will not be easy. The new generation is changing very fast and the more experienced skaters are far from the end of their careers. I believe that Bob Burnquist and Sandro Dias, who will also attend the event, have at least six more years of high-level skate ahead”, says Bastos. “But I hope I get the title again in Oi Vert Jam 2011" said Bastos, 24 years, the representative of the older generation. The Oi Vert Jam’s 2011 new ramp also promises to draw attention. With a cutting edge, international standard, the half pipe, 18m wide and 4.20 m high, has two canyons - one on the other - in the middle of the lane with 1.5 m wide each. "We always try to make a ramp more challenging for athletes. And this was the first time that some of them previously consulted to see how they preferred. Build a barrier of 3 meters wide was the most appreciated, as it increases the difficulty of the maneuver and speed requires more time to initiate the turn" said Sandro Dias, project supervisor. Besides the individual event, there will also be proof of Best Trick sponsored by Volkswagen. March 5th, 2011. Photo WCS. Among the highlights Brazilians also worth mentioning Dan Caesar, defending champion Brazil, Edgard Pereira "Grandpa" and Lincoln Ueda. The Oi Vert Jam will SporTV transmission on Friday and Saturday. Sunday, TV Globo transmits the end of the skate individual within the Sport Spectacular. Last year, more than 20 million viewers saw the live transmission in Brazil only. The event is sponsored by the Municipality of Rio de Janeiro, MaxSports, Oi, Sprite and Volkswagen. Oi is the official sports brand. 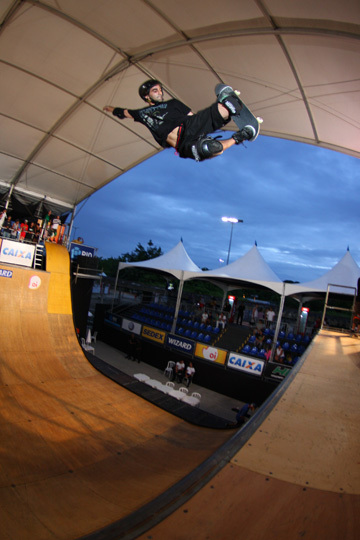 Soon after the Brazilian championship vertical skateboarding, in Brasilia in May last year (2010), a vote was conducted via email and telephone to decide the new committee of professional skaters from vertical. The contestants decided that Eugênio Amaral, Lécio Neguinho and Edgard Vovô are the new representatives of the sport. All decisions regarding the vertical CBSK will be in conjunction with the trio, and on Thursday saw the first official meeting between the skaters and the entity. Speaking of vertical, this week confirmed the Rio Vert Jam. The traditional competition that opens the circuit of vertical WCS will be held again at Lagoa Rodrigo de Freitas on 4, 5 and 6 March. Edgard Vovô, Lécio and Amaral and now part of the committee of professional skaters in conjunction with the vertical CBSK. On the left, there is a newspaper article on the Oi Vert Jam 2011. The king of Half Pipe! If you can read Portuguese, you'll be overjoyed. It's all good stuff.